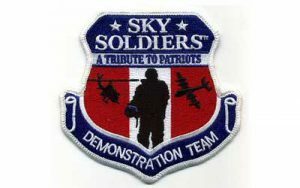 The Sky Soldiers support the Trail Of Honor with their Vietnam era Huey Helicopter ride experience. In Addition, the Sky Soldiers perform their air assault air show daily. 1. Educate the American public to their military heritage through the story of U.S. Army Aviation’s soldiers and machines. 4. Preserve authentic, flyable examples of Army aircraft and utilize them in aerial, educational “living history” demonstrations and presentations so that the symbols of American’s military legacy may always remain in our skies for future generations.